structural steel, aluminum, stainless, and wrought iron ornamental. 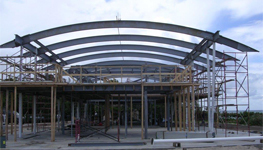 The skilled experts at Gator Welding work closely with contractors, architects, engineers and designers to fabricate all types of structural Steel. A commitment to excellence coupled with the experience, of our skilled craftsmen, is incorporated into out custom Gates and Rails. Attention to detail function and purpose is the foundation of our success. Whether your need is for stairs, columns, buckets, I-Beams, panels, gates, louvres, or grills, we can accommodate all your designs. We service Sewalls Point, Hutchinson Island, Stuart, Palm City, Hobe Sound, Tequesta, Jupiter, Jupiter Island, Juno Beach, Palm Beach Gardens, Lost Tree Village, North Palm Beach, West Palm Beach, Palm Beach Island, Caloosa, Loxahatchee, Lake Park, Boca Raton, Manalapan, and Singer Island. bonded and certified in A.W.S. D1.1 for all you jobsite needs. Servicing South Florida since 1967, we have become diversified over the years to meet the needs of an expanded customer base.We service a wide variety of industries and customers! Our capabilities include specialities such as stainless steel welding, aluminum welding, radiused bends and component assemblies. The right care can ensure the success of any project We believe in partnership & trust and work with you to create.